The Tarahumara or Raramuri, as they call themselves, inhabit the Copper Canyon, as it is known in the U.S., or the Sierra Tarahumara in northwest Mexico. The actual name Tarahumara was what the first Spanish called these Native American people. The Spanish originally encountered the Tarahumara throughout Chihuahua upon arrival in the 1500's, but as the Spanish encroached on their civilization the shy and private Tarahumara retreated for the nearly inaccessible canyons of the Sierra Tarahumara. Only the Jesuit missionaries followed at first and with only scattered success. After mineral wealth was discovered in the mountains, many areas where Tarahumara Indians lived became desirable lands to the miners & mining companies forcing the Tarahumara once again to head farther into the remote canyons. Today, the Tarahumara are Mexico's second largest native Indian group with between 50,000 & 70,000 people. Today the Tarahumara live in caves, under cliffs and in small wood and stone cabins in remote areas. They live a simple life undisturbed by modern technologies. They are known as a quiet and considerate people who are expert farmers and runners. 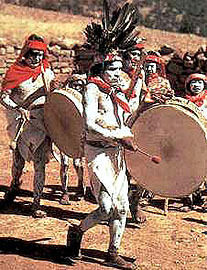 Rarámuri has been translated to mean "runners" in their native language. Due to severe drought in northern Mexico, the Tarahumara have suffered famine in the past few years. Corn is the main staple along with beans. Potatoes, and apples can also be found. 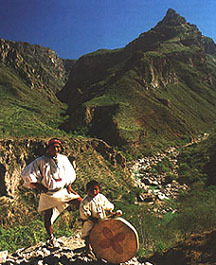 Some Tarahumara raise domesticated animals such as goats and cattle. Fish, small game & herbs (a Tarahumara speciality) round out their diet. Traditional clothing for the Tarahumara consists of a white cloth shirt, sometimes with colorful prints, white cloth pants or wraparounds with colorful belts or accessories. Headbands of cloth usually red are worn upon the head. Sandals or huaraches are the footwear of choice. Running is what the Tarahumara may be most legendary for in the world. Relief and various organizations have entered Tarahumara runners into events such as the "Leadville 100-Mile" in Colorado. The runners have surprised many by running in their tire-soled sandals and winning some of the these long distance races. Running or "foot throwing" has always been a tradition and necessity of the Tarahumara. It is their only mode of transportation and many of the small communities are far apart. They also have their own events, and this is were "foot throwing" comes into effect. It is a competition known as Rarjíparo and consists of a small wooden ball which is "thrown by the foot" by teams in race to finish before the other teams. The races can last days. The Tarahumara are very religious and desire their privacy and respect if you should happen unto their festivals. Two larger events are Semana Santa (Easter Week) and the Fiesta Guadalupana in December. These religious rites are a mixture of Christian and Tarahumara beliefs. There are also other times of celebrations, such as harvests, which are interwoven with tesgüino. It is an alcoholic beverage made of corn and grasses that is good only for a couple of days after it is brewed. Natives will drink until passed out in some cases. The Mexican Government recommends asking for permission when taking photos, entering accommodations or crossing Tarahumara land. Respect all celebrations as well as rights to privacy by these proud, but quiet people.